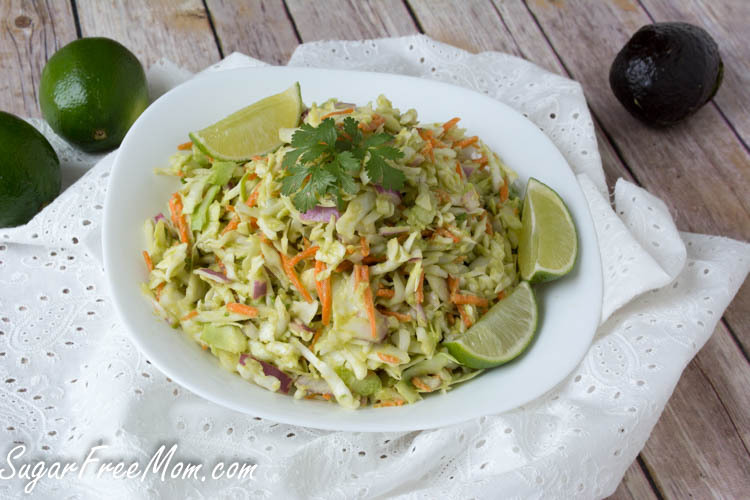 This coleslaw is anything but typical! Made without mayonnaise, but with creamy avocado as the dressing, with a hint of lime, it’s the easiest side to bring to any summer gathering! Ripe avocadoes need to be used at just the right time or the inevitable gorgeous green turns brown and your bubble of happy is burst once you’ve discovered you missed the mark. 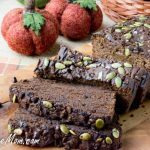 Fortunately for this recipe even if you miss the “just perfect” time to slice and discover your perfect avocado is not so perfect, you can still use it. Of course super brown over ripe wouldn’t be the best to use here but just turning a bit brownish around the edges isn’t the end of the world as long as most of it is salvageable and still green. 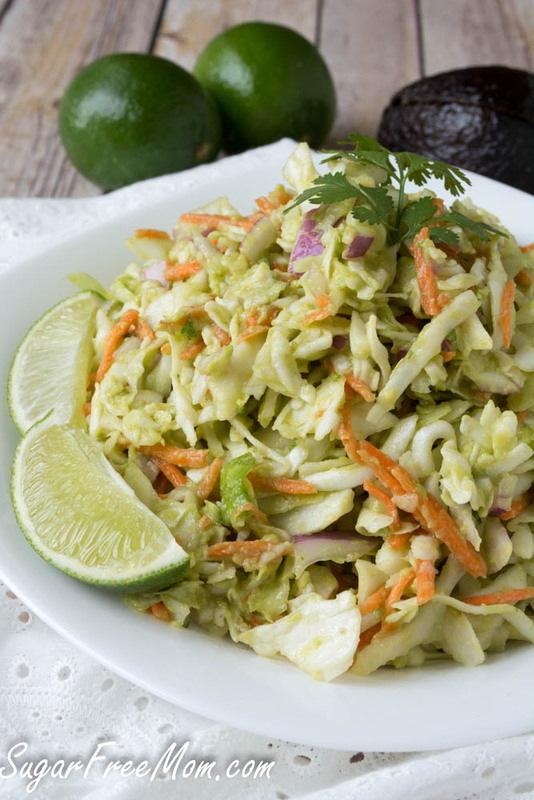 Once mashed with the acidity of the lime and a few simple ingredients and you’ve got a an incredible dressing that may win you over forever from a typical mayo type coleslaw! Even if you’re not an avocado fan you won’t even notice a strong avocado taste as perhaps a guacamole would provide. 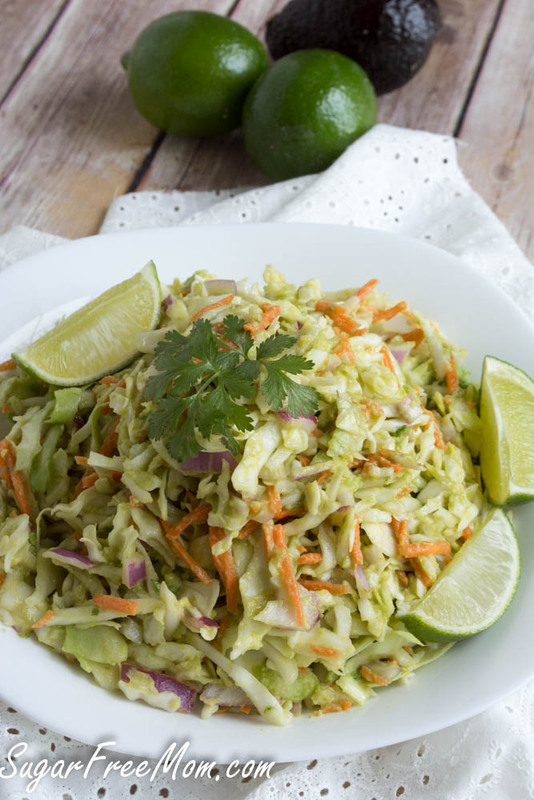 The lime takes overs and wins the battle of the flavors and the avocado dressing sticks to the shredded cabbage like white on rice! The color and taste will only enhance after a day or two in the fridge. Up to 3 days later I was still enjoying mine and no browning happened at all. 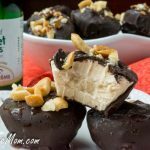 This is an easy recipe to take to a cookout or party this summer. In fact you can even make it and take it camping or make it while camping! I’ve got quite experienced in the camping arena as my family and I were away 8 days long! My picky teen has never been a fan of coleslaw but my younger two have always liked it when I’ve made it with Greek yogurt and lemon juice. Bringing a large container of yogurt in the small fridge we had to hold our food wasn’t an option. 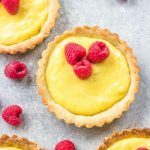 Taking two small avocadoes that don’t need refrigeration, well that’s how this recipe came to be! 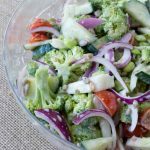 4 ingredients, some seasonings and about 5 minutes of your time and you’ve got a side dish for any weeknight or summer cook out! You can shred your own cabbage it was almost 2 cups worth, but I took the easy way out and bought a prepackaged coleslaw from the market. 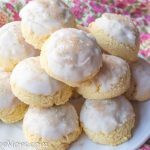 If limes your not flavor of joy, try lemon. Another oil could also be subbed here if you prefer as well as sweetener of choice or none at all. Place coleslaw, onion and cilantro in a large serving bowl. In a small bowl, whisk the lime juice, vinegar, oil, stevia and salt and pepper. Stir the mashed avocado into the dressing ingredients. Once all incorporated, taste and adjust seasonings or sweetener if needed. 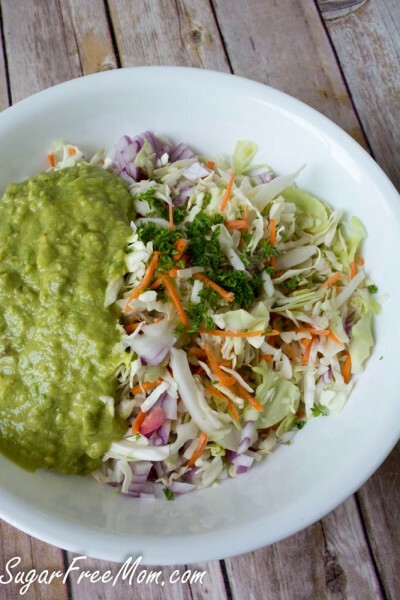 Toss with coleslaw in the large bowl and chill for an hour before serving. 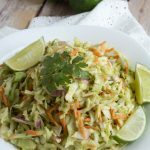 I am not a huge coleslaw fan ( its more of a texture thing), but I might make an exception if it is mayo free and uses avocado instead! Looks great! This looks awesome! I love using avocados instead of mayo! 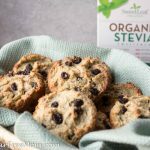 I know that this is a sugar-free recipe, but I don’t have any stevia, and was wondering what would be the equivalent with honey or unrefined sugar? I would probably only use 1/4 cup of either and taste and adjust. This look substantially better than any coleslaw ever. Normally I don’t even like coleslaw but this one has me drooling over here!! What a great idea to use avocado instead of mayo! I bet that adds great flavor as well! What a great twist on coleslaw. 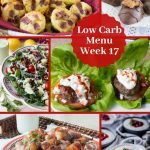 I love avocados – and never thought to use it in a coleslaw! Genius! Gorgeous and using avocado is pure genius!!! Love that you used avocado instead of mayo…yum! My Mom absolutely loves cole slaw! I bet she’d like this. 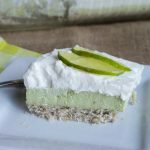 Avocado is the ultimate ingredient to make things creamy and better … yummm I love it! Looks amazing Brenda. 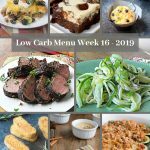 My youngest dd is allergic to egg, so I always use a vinaigrette for cole slaw…next time I’m trying this instead! Yum! 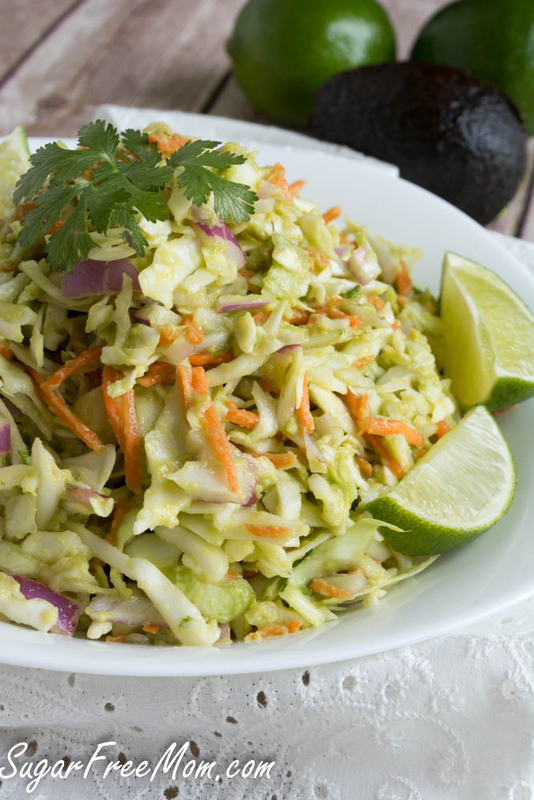 Avocado is a great way to make a creamy cole slaw! 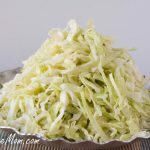 i love this idea.. i hate the taste of mayonnaise so i definitely will be recreating this slaw recipe! Love the idea of mayo free coleslaw. Pinning!